The only thing crazier than the size of my sock yarn stash or the number of socks I've been knitting lately is the fact that as of last night, I had no handknit socks to wear today. I had to do the bowl-wash in three installments because the washer was otherwise occupied. So now I know: ten pairs of socks seems like a lot, but it's not, especially when three are too warm for anything but supercold winter days and one of the remaining seven are summertime ankle socks (worn in desperation a few days ago owing to the dwindlingness of sock cubby contents.) I also know that time-sucking decluttering has impacts far beyond bruised finger muscles and aching legs and feet. I mean, who runs out of time and energy to drop socks into a bowl of Soak-infused water? Though I did get them well onto the ankle last week. I really like how the lace pattern is disrupting the line of the stripes. 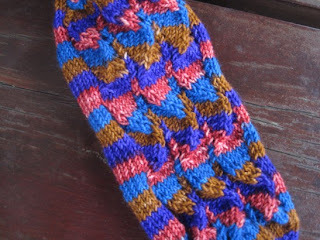 My fingers are still sore today but I'm bringing one of these socks along with me anyway for long public transit rides. 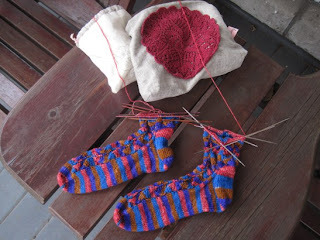 No waiting for International Knit In Public Day for this girl. But first... gotta go check the laundry line and see if I have a pair of socks dry enough to put on yet. My toes are cold! I wash my socks weekly with the normal laundry. I have been known to put them in the dryer occasionaly, but most often hang them to dry.